You are not here by accident. God loves you more than you can ever imagine! He wants you to have a personal relationship with Him through Jesus, His Son. But there is just one thing that separates you from God. That one thing is sin. People tend to divide themselves into groups – good people and bad people. But God says that every person who has ever lived is a sinner, and that any sin separates us from God. Yes, our sins demand punishment – the punishment of death and separation from God. But, because of His great love, God sent His only Son Jesus to die for our sins. Jesus paid the price for your sin and mine by giving His life on a cross at a place called Calvary. God brought Jesus back from the dead. He provided the way for you to have a personal relationship with Him through Jesus. When we realise how deeply our sin grieves the heart of God and how desperately we need a Saviour, we are ready to receive God’s offer of salvation. To admit we are sinner’s means turning away from our sin and selfishness and turning to follow Jesus. The Bible word for this is “repentance” – to change our thinking about how grievous sin is, so our thinking is in line with God’s. 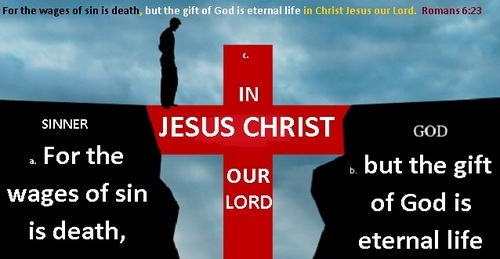 Are you ready to accept the gift of eternal life that Jesus is offering you? If you have trusted Jesus as your Lord and Saviour, we would love to hear from you. We want to rejoice in what God has done in your life and help you to grow spiritually, please contact Jonathan on minister@1stsaintfield.org.uk . We believe in the ministries God has set in His church including evangelists, pastors and teachers. We believe in the universal sinfulness of mankind since the fall, making them subject to God’s judgment.